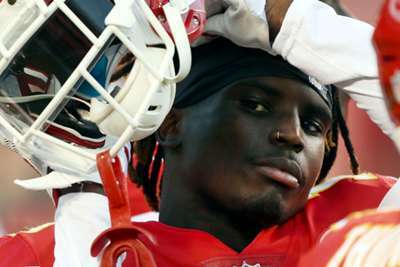 A spectator who threw a beer at Kansas City Chiefs wide receiver Tyreek Hill and flipped him off during the New England Patriots' thrilling 43-40 victory on Sunday has been identified and banned from future games at Gillette Stadium. The Patriots made the announcement on Monday, citing a violation of "the fan code of conduct" in a "letter of disinvite" sent to the fan. With New England holding a 40-33 lead with three minutes remaining in the NFL game, Chiefs quarterback Patrick Mahomes hit Hill for a 75-yard game-tying touchdown. Hill then ran to the wall behind the end zone, where he was doused with beer and shown the middle finger by a supporter. Hill later said through his agent that he wants the fan prosecuted and "that type of behaviour is unacceptable." Chiefs' Hill put on an impressive performance as he finished with seven receptions for 142 yards and three touchdowns. Still, the Patriots eventually secured the win off the foot of Stephen Gostkowski, who made the game-winning field goal for New England as time expired.